The key to making risotto is patience. Lots of patience. I had never made it before I made this recipe. I’ve watched several Food Network stars make it. Paula Dean, Giada De Laurentiis, Tyler Flourence - the list goes on. And it looks a whole lot easier on the tube. They conveniently edit out the 30 minutes of stirring and pouring that it takes to make a batch. I personally think that someone else did the stirring for them during the taping - by the time I was done, I was half bent over the stove and board out of my mind waiting for the rice to soften just to the point of al dente! Had I not given up beer for Lent then I’m sure I would have downed a six pack with one hand as I stirred with the other. I didn’t see all that labor on any of the TV shows while risotto was being made. Come to think of it, I never see them doing any dishes either! In all seriousness, I really did enjoy making this. 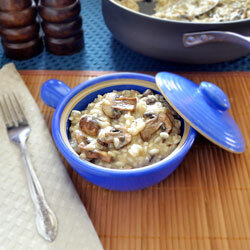 The starch from the rice is slowly absorbed into the chicken stock and forms a creamy gravy. The process takes longer than I thought it would but the end result was a tasty dish that I’m going to try again. It’s cool to see it come together. I think this could be a real knockout dish for those times when you want to impress someone. I want to try it with a protein like chicken or maybe roasted red peppers. The potential for a great dish is limitless. I think that a great dessert could be made from this also, it’s just a matter of finding the right balances. When I originally started to make this dish I had to postpone the shoot because I realized that I needed a short grain rice to make a good risotto. 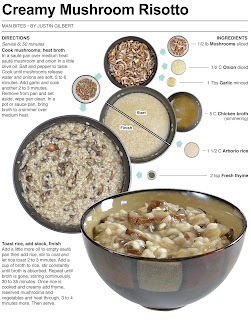 The shorter grains are starchier and work better to make the creamy gravy that really makes the dish. I settled on arborio rice, which worked fine in the end. I made this on Friday and thought I was doing the right thing for Lent - no meat on Fridays. 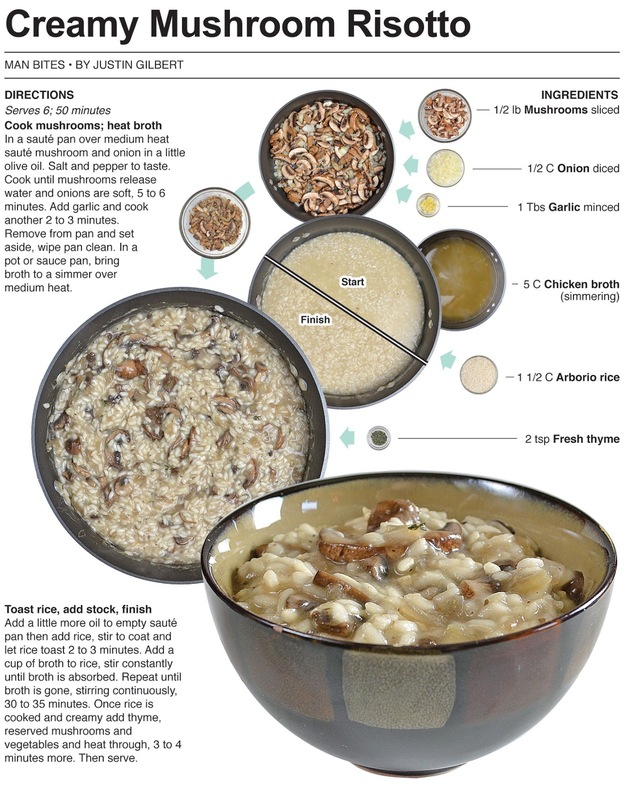 It wasn’t until I had eaten a bowl that I realized that I used chicken broth in the recipe! Technically I didn’t make a meat dish, but at least one chicken had to die for me to have this yummy supper. Once again I was foiled, it really is tougher than one would think to give up meat on Fridays for lent - especially when you’re a carnivore like myself. In a sauté pan over medium heat sauté mushroom and onion in a little olive oil. Salt and pepper to taste. Cook until mushrooms release water and onions are soft, 5 to 6 minutes. Add garlic and cook another 2 to 3 minutes. Remove from pan and set aside, wipe pan clean. In a pot or sauce pan, bring broth to a simmer over medium heat. Add a little more oil to empty sauté pan then add rice, stir to coat and let rice toast 2 to 3 minutes. 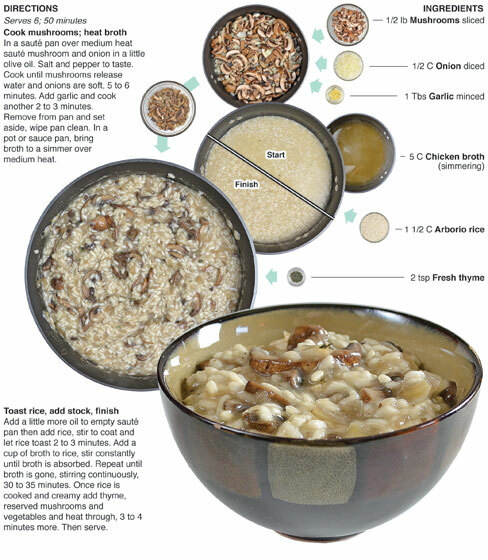 Add a cup of broth to rice, stir constantly until broth is absorbed. Repeat until broth is gone, stirring continuously, 30 to 35 minutes. 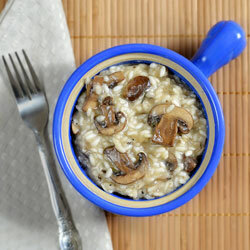 Once rice is cooked and creamy add thyme, reserved mushrooms and vegetables and heat through, 3 to 4 minutes more. Then serve.